Green beans are a vegetable that I could eat all day long, next to broccoli. When I was younger, steamed green beans with soy sauce and fresh lemon were a favorite of mine! But trading in the soy sauce for olive oil, fresh tomatoes, and thyme has yet to disappoint the palate and this can be played up to accommodate many dishes by interchanging different spices or just simple salt and pepper is pleasing as well. I grew up eating lots of vegetables and I can only hope that the same appreciation for the taste of them will transpire into my kids. I will admit that the kids aren’t completely won over with green beans (they’re green, remember? ), but I still put it on their plates as they will still rip the beans open and eat the actual beans inside. I call it positive progression, hah. This was originally from one of Rachael Ray’s 30-Minute Meal episodes years ago, but as I look for the recipe now, it no longer exists, hmmm…. I will approximate the ingredients, so please don’t hurt me if they’re off. All I can say is estimate to taste. Ingredients have been approximated. My best advice is to add seasonings to taste. Dried thyme can be used in place of fresh time. Fresh lemon and or lemon zest can be added for extra oompf! The kids love ripping the beans open to eat the beans inside… so literally, they do eat the beans, lol. I have yet to fully win them over with the full bean itself, but I’ll get them eventually, hah. Hubbs likes this side dish and so do I. And although we’re halfway to hitting the top of the charts with this side dish, I will still continue to make it. 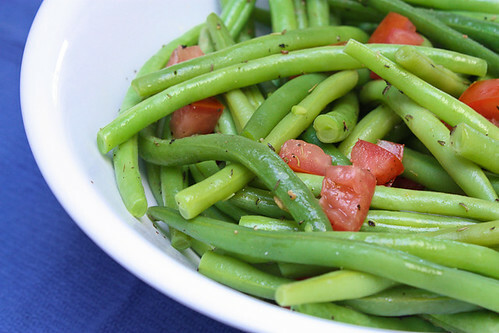 Steam green beans in 1-2″ of water until crisp or fork tender. Drain. Drizzle with olive oil, and toss with remaining ingredients.